On the occasion of The Faculty of Fine Arts’ recent 28th anniversary, having been the founding faculty of LASALLE College of the Arts in 1984, we are pleased to present NINE +- 1. The curatorial theme could not been more appropriate, given the faculty’s commitment to breaking new ground in visual arts and serving as a benchmark for artistic practice in Singapore and the region. In this exhibition, NINE +- 1 reveals the breadth of materials, processes, techniques, languages, issues and concerns placed in a diversity of spaces, time and ‘zones’. The processes underscore the educational approach to art practice of the faculty. Art practice is no longer an end in itself, but rather art is made in the process of questioning. 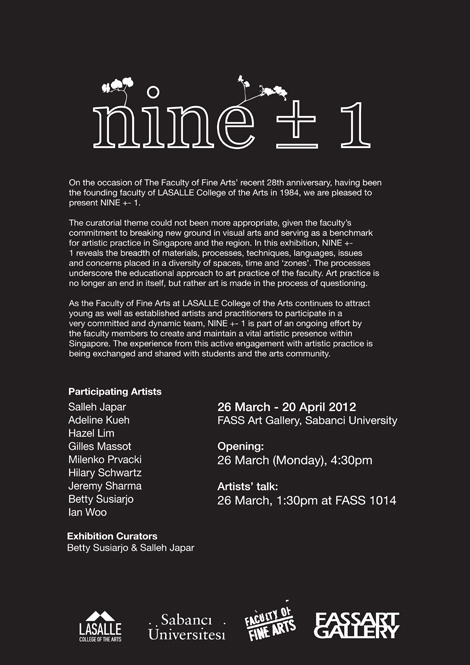 As the Faculty of Fine Arts at LASALLE College of the Arts continues to attract young as well as established artists and practitioners to participate in a very committed and dynamic team, NINE +- 1 is part of an ongoing effort by the faculty members to create and maintain a vital artistic presence within Singapore. The experience from this active engagement with artistic practice is being exchanged and shared with students and the arts community. Participating Artists: Adeline Kueh, Betty Susiarjo, Gilles Massot, Hazel Lim, Hilary Schwartz, Ian Woo, Jeremy Sharma, Milenko Prvacki, Salleh Japar.